Grilled pita bread topped with homemade ricotta cheese, caramelized onions, and spicy sausage. ‘Tis the season for man food. Lots of food. Big flavor. And men running around in spandex chasing after an oddly shaped ball. That’s right, it’s football season. The BIG game is right around the corner. Have the men in your life started making game-day food requests? Squirrel started planning his game-day feast weeks ago. Football is a big deal at our house, and I’m always in charge of preparing the meticulously selected menu items. You can’t have football without food. It just wouldn’t be right. If it weren’t for the spread of delicious food, I wouldn’t participate. While the men look cute in their tight pants, it’s not enough to keep me interested for 3+ hours. But food…food always keeps my attention. Bring on the apps, finger food, dips, nibbles, bites, and adult beverages! My game-day drink of choice is wine. Since we’re prepping for the BIG game, I’ve invited two bottles to join the party: Cafe Zinfandel and White Merlot by Gallo Family Vineyards. I’m no newbie to Cafe Zinfandel. It’s one of my favorites and go-to selection when I’m hosting a gathering or cozying up with a good book after work. This dark red zinfandel is just the right amount sweet. It’s bursting with flavors of ripe strawberry, watermelon, and juicy raspberry. I keep a small stock in my wine cabinet for whenever the mood strikes. Their White Merlot is light and crisp with a hint of plum and cranberry. I just made room in my wine cabinet for a few extra bottles. I decided to make my job easier this year and created a simple game-day menu full of easy appetizer recipes. This sausage & caramelized onion pita pizza recipe requires very little effort. The guys will love them because they’re topped with meat, and the ladies will love them because they’re a classy treat. I purchased store-bought pita bread that I grilled on the stove top. You can use an indoor grill or cast iron pan to heat your pita. Brush both sides of the pita with a bit of olive oil and cook until crisp and slightly charred. For this recipe, I used a roll of spicy sausage that I browned in a sauté pan until crisp. I caramelized the onions in the same pan I used to brown sausage. Because, less dishes. After you have all of your elements ready to go, it’s time to assemble the pizzas. Spread your grilled pita with a generous amount of ricotta cheese. I used my recipe for homemade ricotta cheese, but you can just as easily use the help from the store and purchase a container of ricotta. Top the ricotta with some of the crispy sausage and caramelized onions. Cut the pizza into quarters using a pizza cutter. Of course, serve with wine. Brown the sausage in a saute pan over medium-high heat until brown and crispy, about 10-12 minutes. Remove the sausage from the pan using a slotted spoon and transfer it to the plate towel-lined plate, reserving the grease. Set aside. Turn the heat down to low and add the sliced onions to the saute pan with the reserved sausage grease. Sprinkle with salt and pepper. Cook, stirring often, until the onions are caramelized and amber brown in color, about 30-35 minutes. Heat a sauté or grill pan over medium low heat. Brush both sides of all three pita bread rounds with olive oil, about 1/2 teaspoon per side. Cook the pita bread until toasted, about 2 minutes per side. To assemble the pita bread pizzas, spread 1/4 cup of ricotta cheese on each piece of toasted pita bread. Top with a layer of the browned sausage and caramelized onions. Sprinkle with chopped thyme. Using a pizza cutter, cut the pita bread into 4 quarters. Serve immediately. I just found my new favorite pita pizza. YUMMY! Pizza AND caramelized onions! My favorites! I’m in love with this pizza. This looks wonderful and so easy to make! Gotta love anything with caramelized onions. What a great combo! This looks delicious! I love the use of pita brad for the base and then adding home made ricotta, Oh-Em-Gee! Ohhh, simply gorgeous! I am so loving your recipe! Pita pizza is awesome. I love your unique take on it! Forget big game day. This sausage caramelized pizza is perfect for any day! “Tis’ the season for men running around in spandex”, lol! This pita pizza is amazing! Oh myyyy! I love ricotta on my pizza. This looks absolutely delicious! Yummmm I love anything topped with caramelized onions! Ricotta always adds a nice creamy touch too — yum! Caramelized onions are the way to my heart!!! These little pizzas look delicious! Using pita as a crust is so smart! And caramelized onions are my absolute favorite pizza topping. Caramelized onions and sausage make these pita pizzas perfection! Oh, girl…you had me at pizza and homemade ricotta! Add some caramelized onions and a spicy sausage and this just spells heaven! Thank you for sharing, Jennie. Have a great week ahead! Homemade ricotta?!! I MUST do this! I’m foreseeing a ton of pizzas in my Super Bowl party future, and I’m thinking I’ll need to try your toppings on for size. There’s just no going wrong with caramelized onions! Hope you had a great weekend! 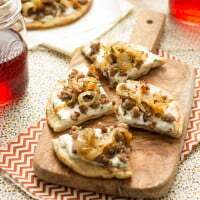 I love pita pizzas and this combination of sausage and onions sounds fabulous! Anything related to pizza has my heart! And when caramelized onions are involved, I’m totally in!!! I’m a big fan of these delicious pizza toppings! I can’t get through an entire football game without lots of yummy snacks! Haha yep, Jeff has been planning his menu for at least two weeks now. Mind you, it’ll just be the two of us. I’m digging this recipe. Put caramelized onions and sausage on just about anything, and I”ll be first in line. Also, I just recently discovered how awesome pita bread is at pizza crust. And so easy! I’m with you-the food is all I’m interested in for The Super Bowl and I so wish i could come over to your house and have this pizza! That ricotta! Those onions! Yes, I want this for game day. But, even more, I want it for lunch TODAY! What fantastic flavors! I just made a grilled caramelized onion pizza too! Seriously one of my new favorite things! LOVE the flavors in this! yummy and gorgeous! Ohhhh, now that looks tasty. Love me some caramelized onions.